Several of our Law Enforcement Solutions were featured in the March 2018 Edition of LEPN Magazine. 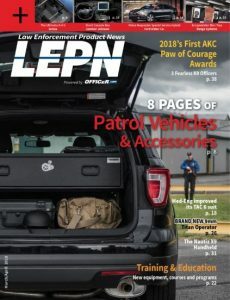 Because this edition of LEPN (Law Enforcement Product News) was focused on patrol vehicle accessories & equipment, the 4910LR Driver’s License Reader was featured on page 11. Officer.com spoke to how Officers are able to fill reports faster with a driver’s license scanner. The 4910LR is purpose-built for electronic ticketing and accident/incident reporting, which allows patrol officers to drastically improve efficiency and accuracy out in the field. Convenient – The 4910LR is easy to store in squad cars. High Performance – The 4910LR is able to scan in all lighting conditions, and can even scan old, scratched or worn licenses. Fast – Read a driver’s license instantly. Efficient – Eliminate manual and handwritten processes. Safe – Officers are able to get off the curb faster. They spend less time on the side of the road and more time on patrol. Click here to learn more about eCitation with the 4910LR. L-Tron’s OSCR360 was also featured on a back insert of LEPN magazine. The affordable OSCR360 solution allows evidence technicians, investigators, and detectives to organize all of their multi-media evidence files. 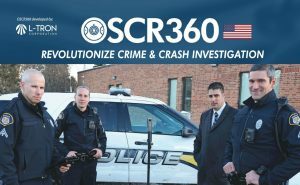 A full crime & crash scene solution, OSCR360 is more than just a camera. The solution allows users to organize, capture, and connect all of their case evidence. Organize case evidence in the software and preserve it forever. Use the capture kit to quickly and easily take 360 degree photos. Cardinal direction & GPS data are collected automatically with L-Tron’s sensor tube. Contain all their evidence in the OSCR360 software. Connect your 360 degree photos and add in digital evidence files. Connect the dots. Use the 360 degree photos and digital evidence to relate suspects, victims, locations, and more. Find the truth – deliver a virtual tour of your case and bring others back to the scene as it was found. OSCR has been used on 23+ active cases/pleas and has been admitted into court as evidence, used during closing arguments and used in grand jury indictments. LEPN or Law Enforcement Technology Magazine was created with the Law Enforcement technology manager in mind. The magazine focuses on emerging trends and technologies within the Law field. Often considered one of the most thorough magazines in the industry, LEPN makes every effort to keep the reader informated and updated on various Law Enforcement products. OSCR360 & eCitation with the 4910LR were both featured in the March 2018 publication. This issue specifically focused on patrol vehicles and accessories – the 4910LR was featured on page 11. Additionally, LEPN called out our upcoming Forensic Photography Refresher Course, taking place on Thursday, April 12th in downtown Rochester. This is not the first time L-Tron has been featured in LEPN – you can view some of our past publications here.